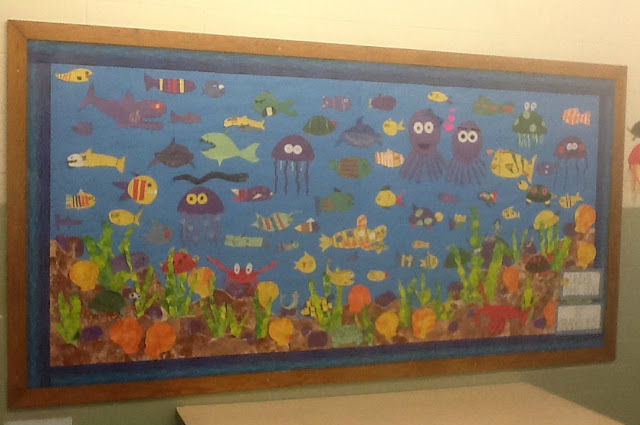 We had so much fun making our school-wide collaborative bulletin board last year; I figured it's time to do it again. So let's go! This time the theme was going to be 'Underwater the Sea'. Kindergarten would create the sand. First grade would create the seaweed. 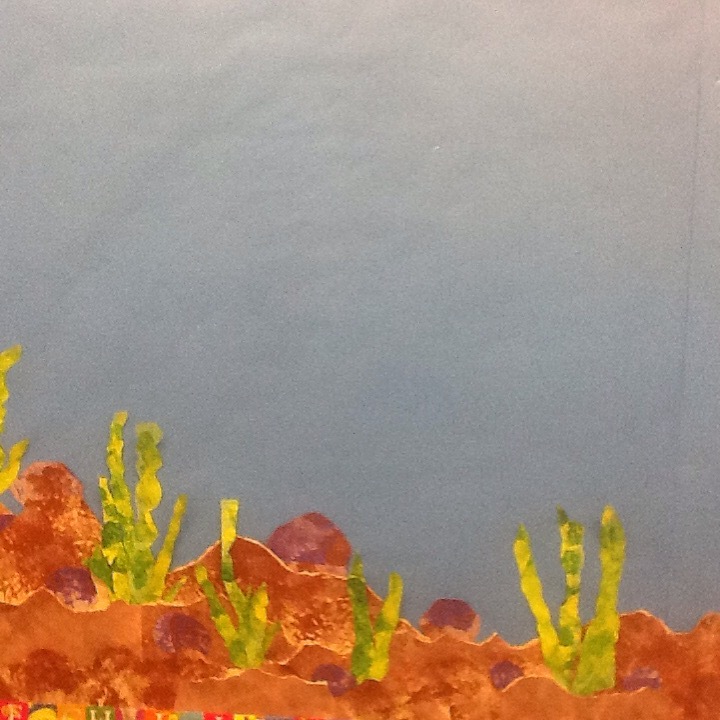 Second grade would create the rocks. 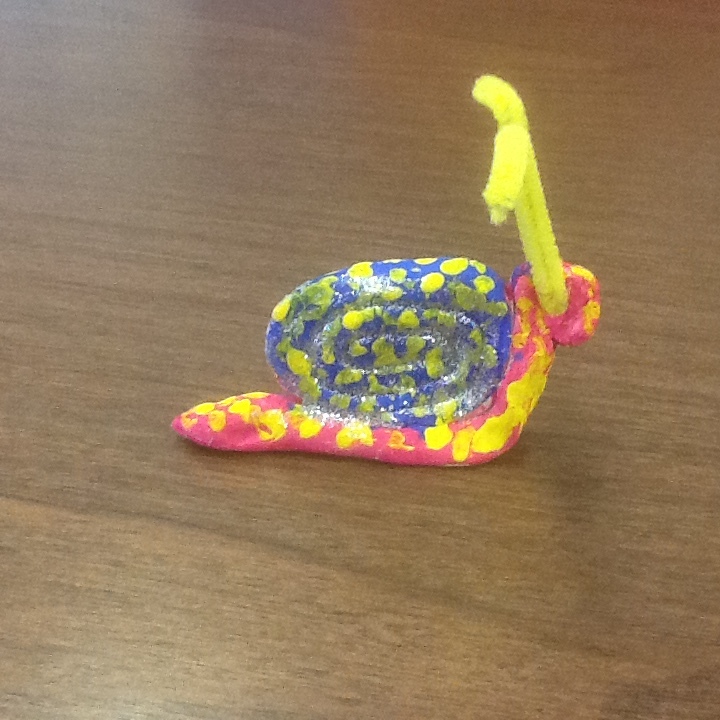 Third grade would create the sea shells. 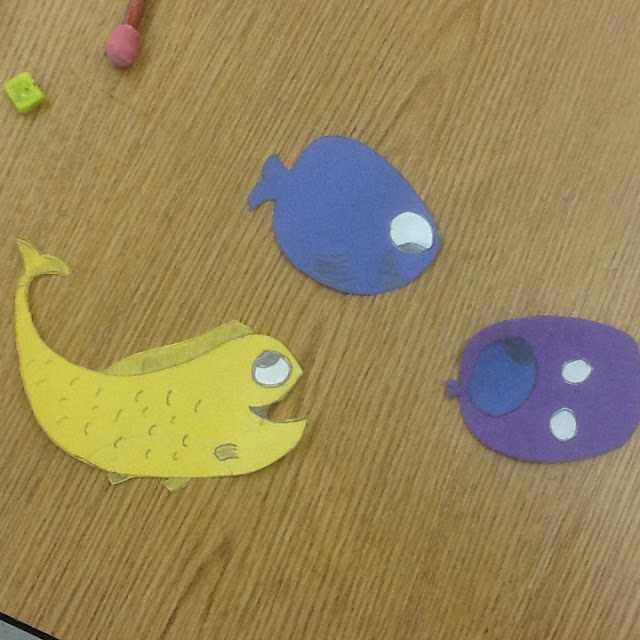 Fourth grade would create the fish. 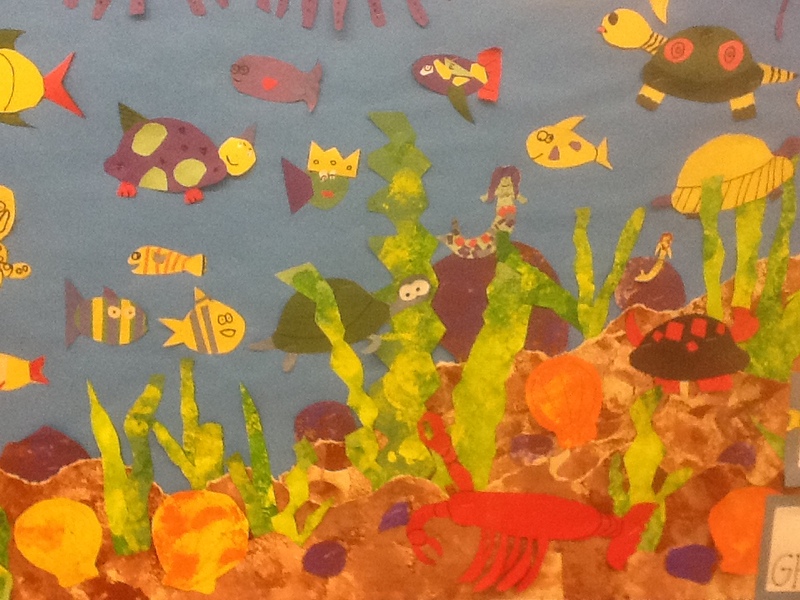 Fifth grade would create all the other sea creatures- crabs, eels, jellyfish, etc. The lower grades worked a lot with sponge painting on this project. 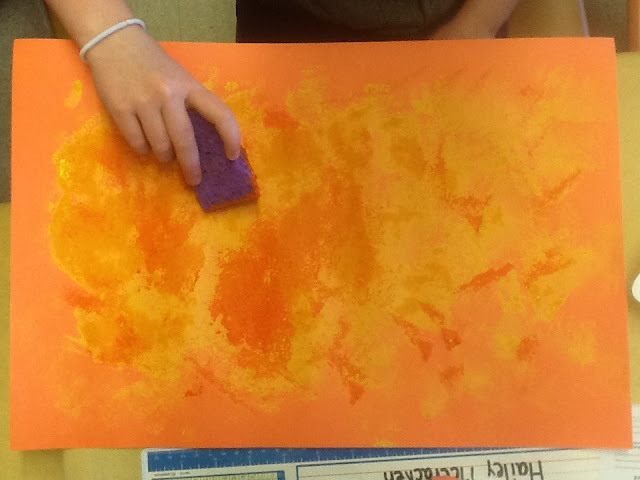 We used tempera paint and a combination of sea and kitchen sponges. 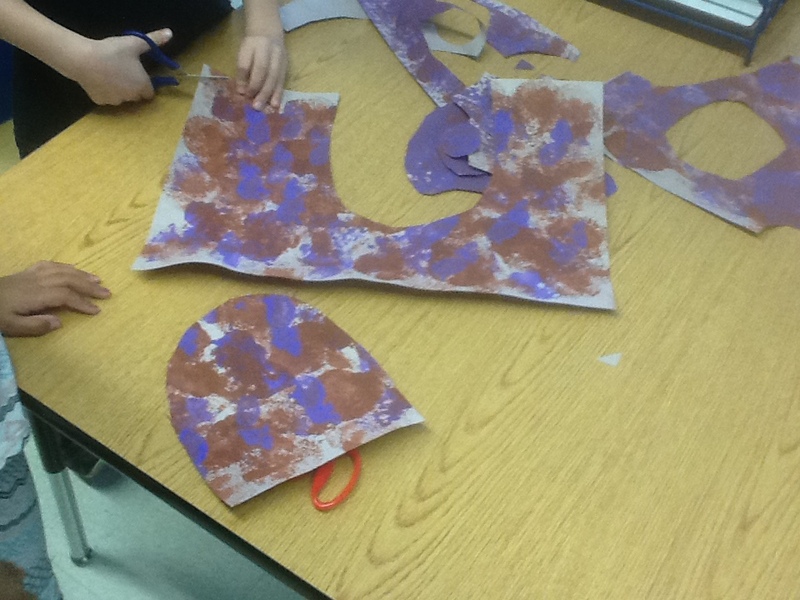 The kindergartners made the sand by sponge painting two shades of brown paint onto peach colored paper. 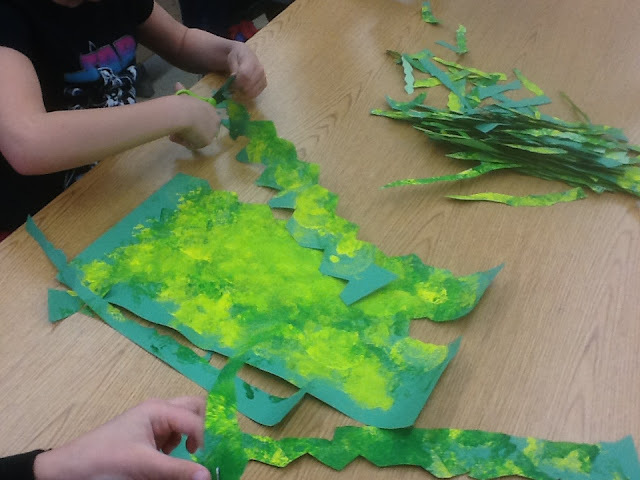 The first graders sponged painted yellow and green paint onto light light green paper to create the seaweed. The rocks are the only part which I would have done differently. The third graders sponge painted them with purple and brown paint on grey paper. But they blended too much in with the sand, so I think I would have had the kids paint them purple and grey. (They still look great on the final board though!!) The last part we sponge painted were the sea shells. The third graders sponge painted yellow and orange paper with yellow and orange paint. 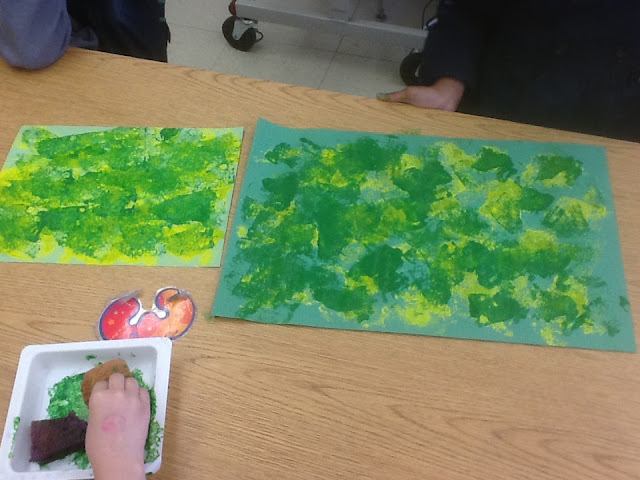 1st graders sponge painting seaweed. 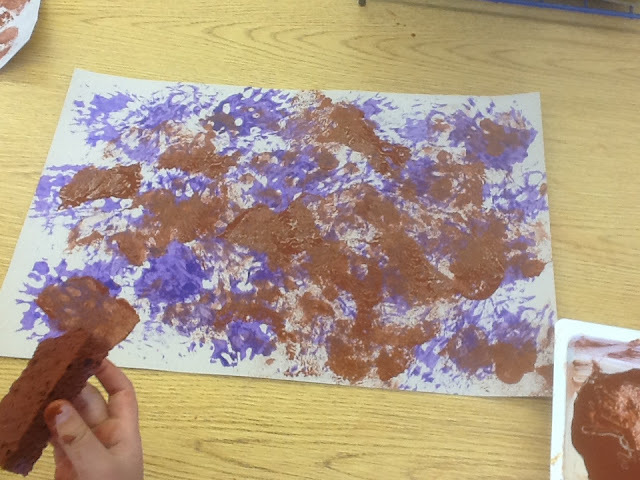 2nd graders sponge painting rocks. 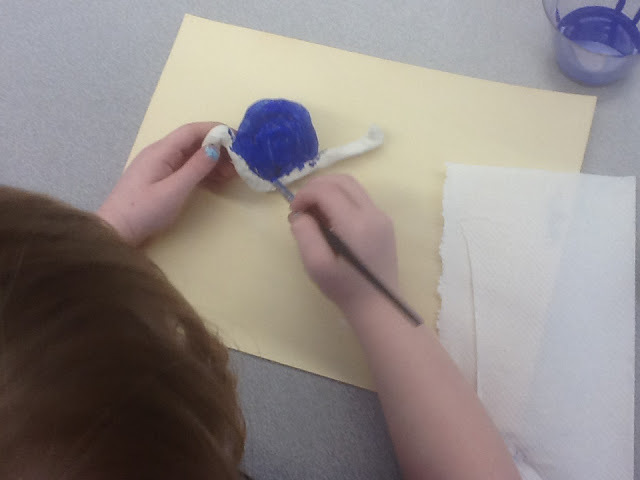 3rd graders sponge painting seashells. The next class, when all the paint was dry, all the rocks, seaweed and shells were cut out! 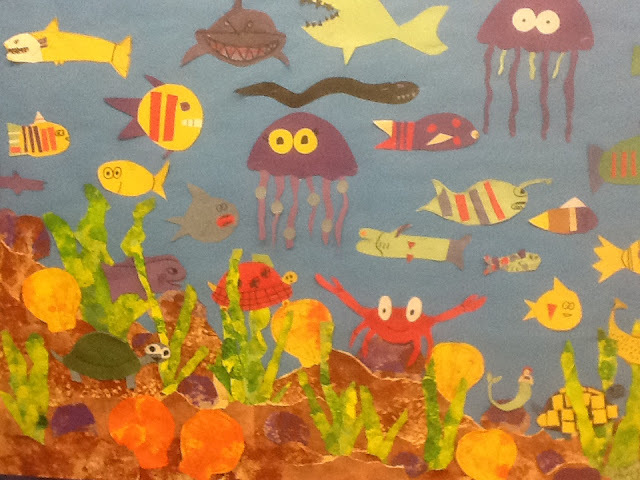 The 4th and 5th graders made all of their sea creatures with markers/ crayons and colored paper scraps from the scrap box. After everything was painted and all cut out, it was time to start putting it all together. The final bulletin board all put together! 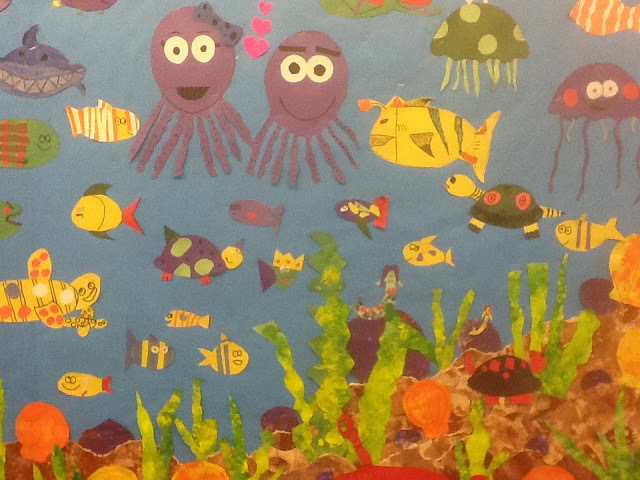 If you want to see another school-wide collaborative bulletin board we made, check out this post. So, what do you think about our school wide collaborative bulletin board? Would this work in your art class? I'm all ears! You can comment below. Raise your hand if you like making Artist Trading Cards with your art classes! You can't see it, but my hand is held high. 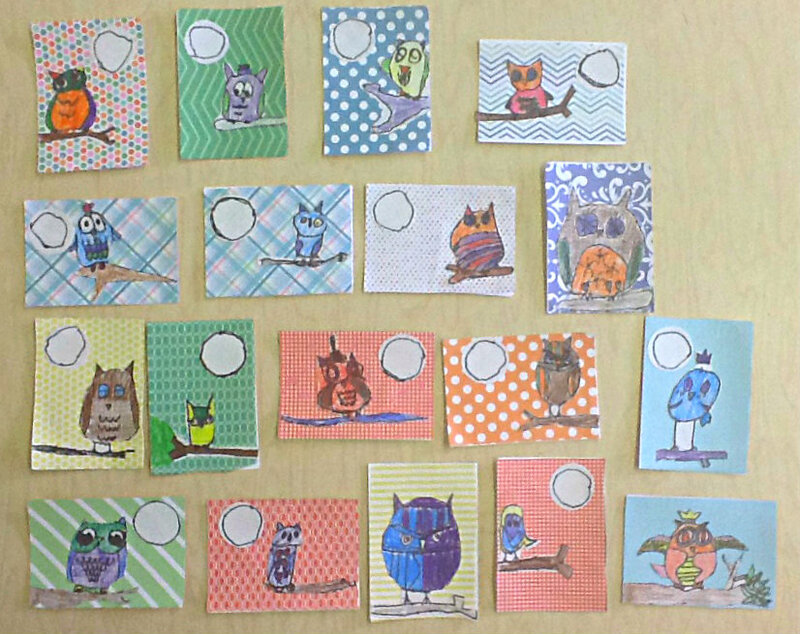 Well, anyway, me and my students loved the whole Artist Trading Card swap project. Real excitement happened in the class. We got ATCs from around the country and around the world. That's why I decided to extend it into another project. From 2D to 3D. Oh my! 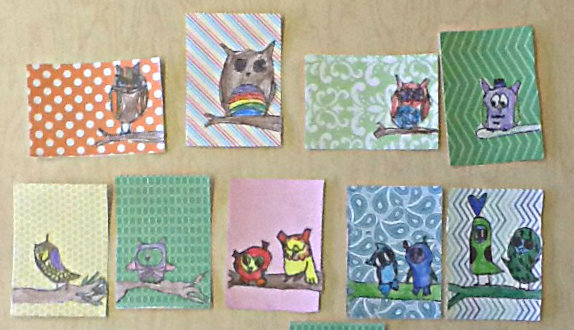 After making our owls on the ATCs, it was time to move into a different medium. Owls made out of clay! The kids started out making clay slabs a quarter of an inch thick. 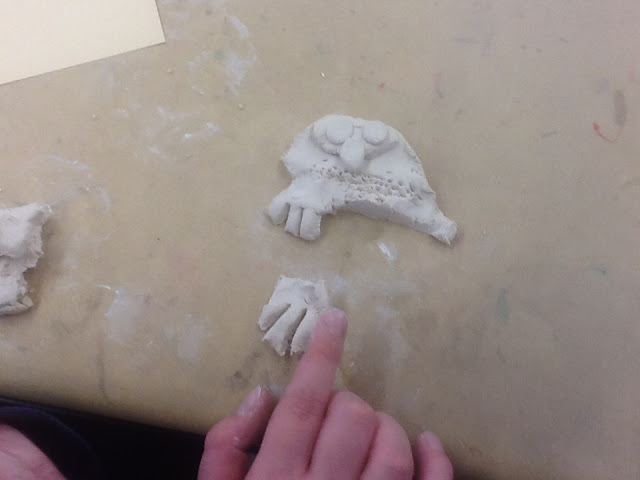 They then used clay tools to cut out the shape of the owl. 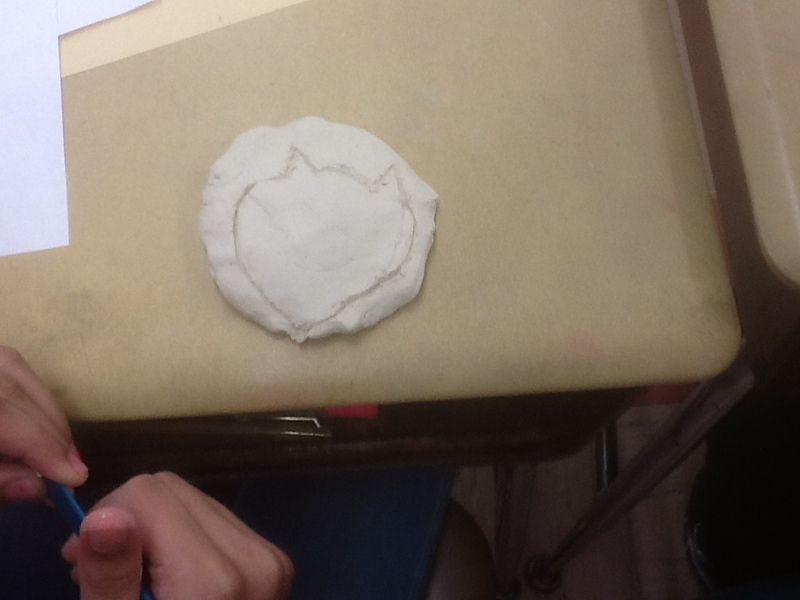 After their owl shape is cut out, they added in details, such as wings, beaks and eyes. 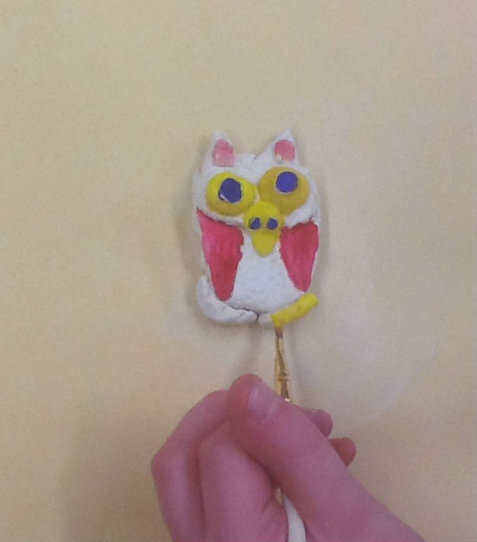 Once the clay owls were dry, the kids then painted them with temper paint. Here are some of the finished painted owls. They're just as cute as the ATCs! After the paint dried I added magnets to the backs. 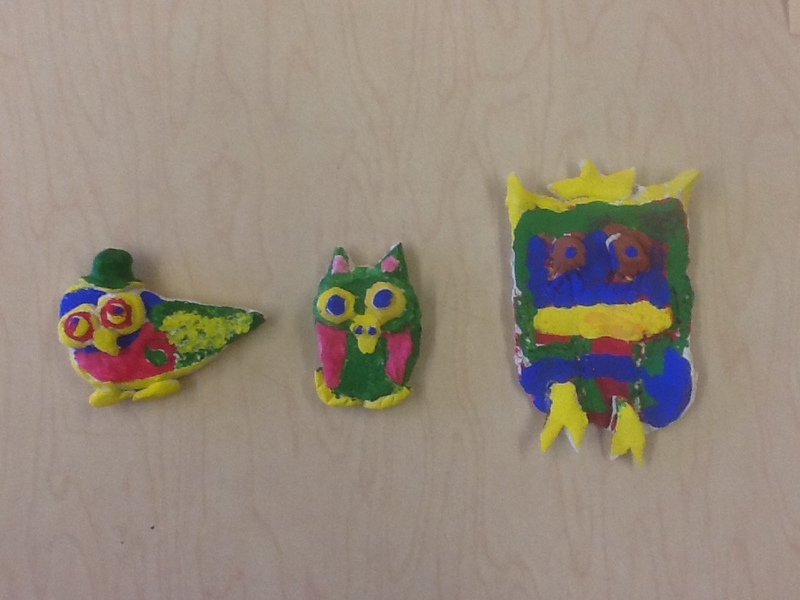 The clay owls ended up being a great lesson extension to our Artist Trading Cards. If you want to find out more about the Artist Trading Card swap, you can read about them and the swap at the blog Mini Matisse. You can also find some info here. 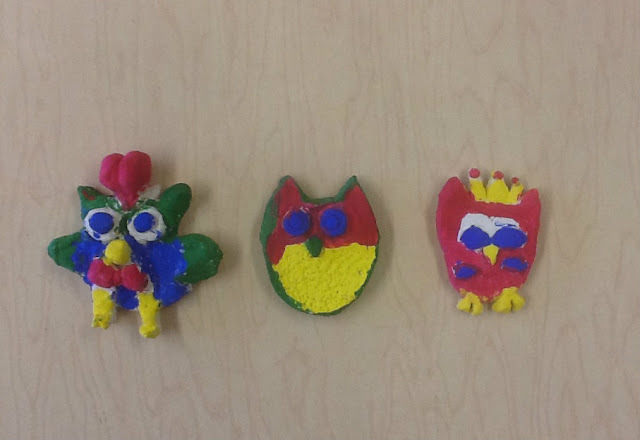 Would these clay owls work in your art class? 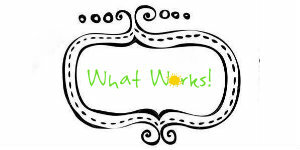 Did you find a way to extend your Artist Trading Card exchange? If you did, you can let us know about it below. 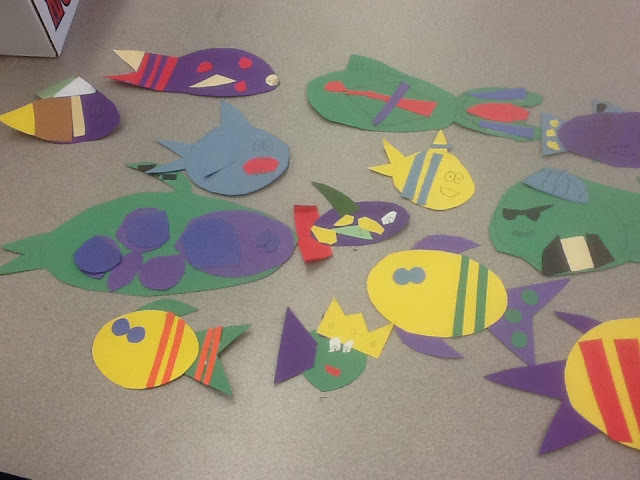 Here's a cute project you can do with your 1st graders. And the best part is... they're actually learning a clay method! Clay, coil snails! Paint! Pipe cleaners! And glitter! (We like glitter here. What can I say!) Your 1st graders can totally do this and will love it! 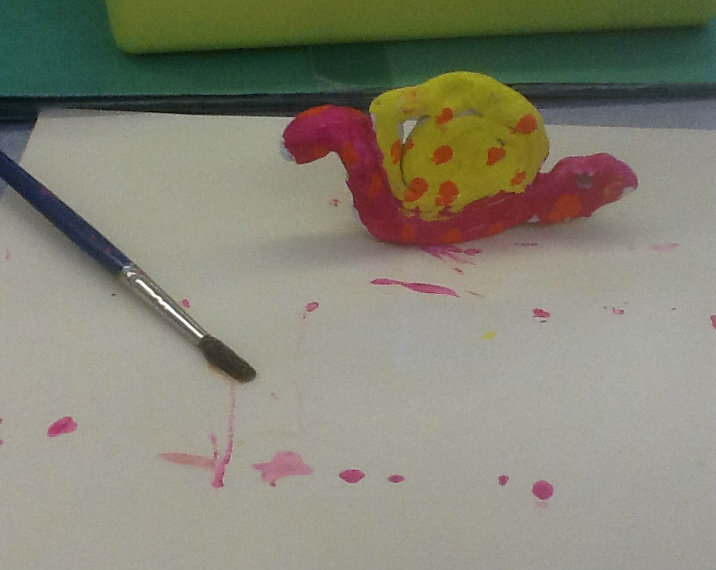 The kids start out by making two clay coils. One short, one long. Teacher alert here! Keep reminding the kids to avoid making the coils with their fingers. Your fingers are bumpy, therefore, your coils will come out bumpy. Encourage the kids to make the coils with the flat, palm of your hand. One coil is then made into a spiral for the shell. The other is attached to to the bottom of the shell as the snail's body. They can make it into any curvy shape they like. Using a pencil tip, put a hole into one end of the body coil. This is where they will insert the pipe cleaners for the antennae later on. After the clay dries you can start painting. I gave every kid a brush. Six tempera colors were chosen and set up at six different stations around the room. Out of those six colors, the kids could chose three to work with. 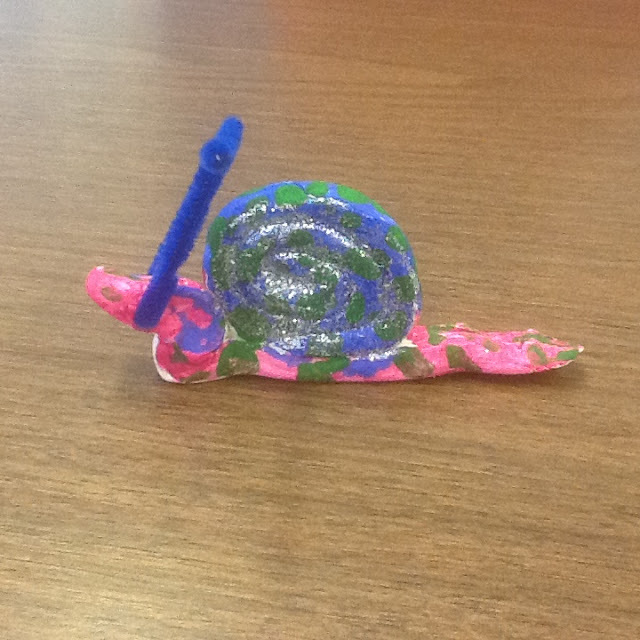 The kids would travel from station to station with their brush and snail. 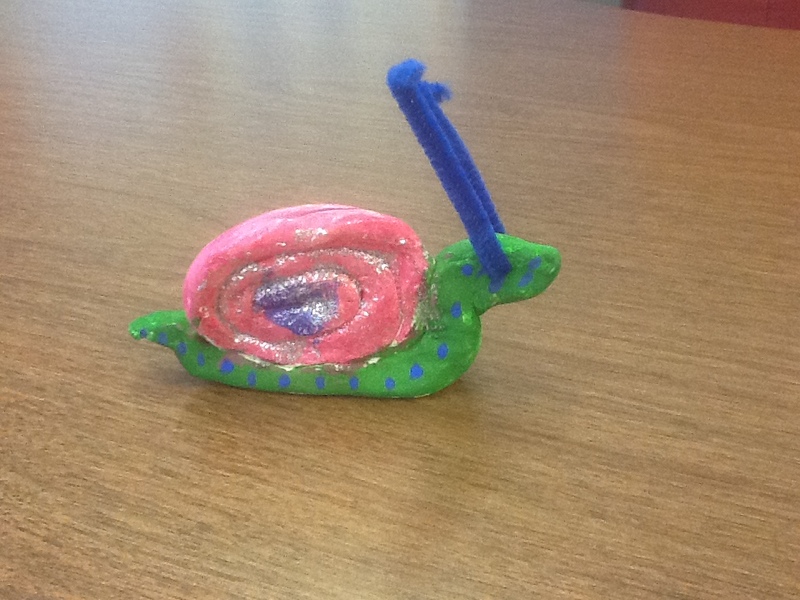 Actually, no snails were broken as they traveled from station to station. Really!!! Having the paint organized into stations worked really well. It's makes everything much easier to handle. Believe me. You won't be sorry if you set your paint up that way. Especially, when you're a traveling art teacher. After the paint has dried, pipe cleaners were thread through the hole that was made with the pencil tip earlier on. We then add glitter. 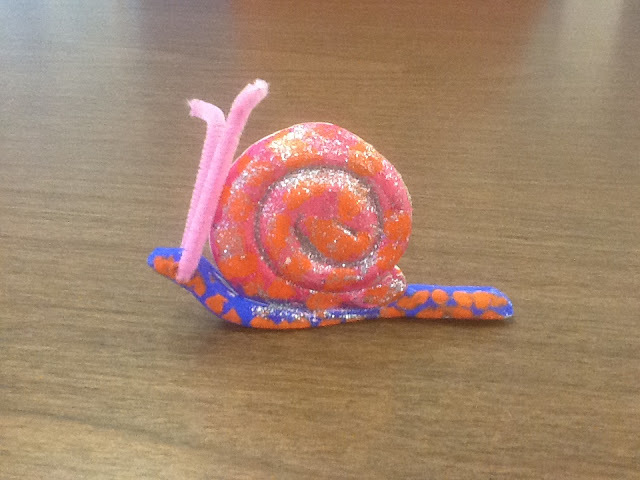 I find that glue glitter works best, as it's easy to work with. The glitter was placed just on the shell. Well... what do you think? 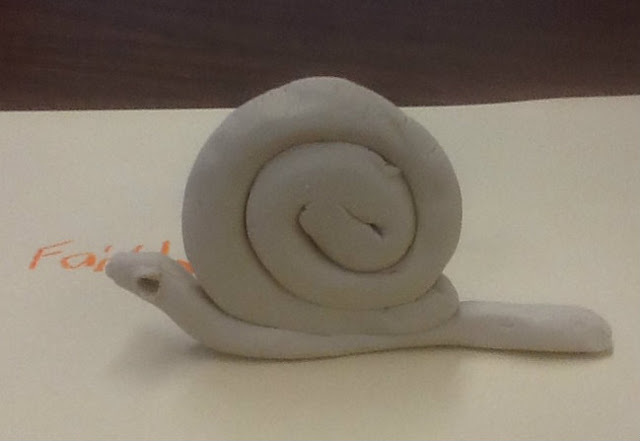 Would this clay project work in your art room? Let me know in the comments below. Copyright © 2015 Art Inklings . Simple theme. Powered by Blogger.